Hanne Andersen is Professor in philosophy of science and Centre Director at the Centre for Science Studies which forms part of the Faculty of Science & Technology at Aarhus University. Her research interests include philosophy of interdisciplinarity, accountability and quality control in contemporary research, responsible conduct of research, science and values, scientific change, and the nature of science and science education. She has previously worked at the medical school at the University of Copenhagen and still has a strong interest in topics such as history and philosophy of epidemiology, the concepts of disease, and causality and probability in the health sciences. Hanne teaches philosophy of science to science students and responsible conduct of science to junior researchers from the sciences. 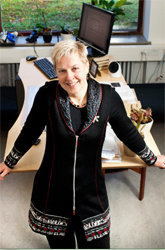 As an ‘engaged’ philosopher of science, Hanne is engaged in local and national initiatives to develop guidelines for good scientific practice that can be recognized as relevant and important by practicing scientists, and neither as abstract rules that do not relate to actual practices nor as over-detailed prescriptions that are seen as missing the point. She is also engaged in developing curricula for training in responsible conduct of science from the bachelor to the PhD level – and beyond! Another strong interest is analyses of the development of contemporary science and the development of a philosophy of interdisciplinarity that can inform administrators and policy makers and help resolving some of the ‘interdisciplinary paradoxes’ and ‘tensions’. Andersen, H. (2014): Epistemic dependence in contemporary science: Practices and malpractices, in L. Soler (ed. ): Science after the practice turn, Routledge, pp. 161-173. Andersen, H. & S. Wagenknecht (2012): Epistemic dependence in interdisciplinary research, in Synthese 190(11): 1881-1890. Andersen, H. (2012): The Second Essential Tension: On Tradition and Innovation in Interdisciplinary Research, in Topoi 32(1): 3-8. Andersen, H. (2011): Conceptual development in interdisciplinary research, in Feest & Steinle (eds): Scientific Concepts and Investigative Practices, Kluwer, pp. 271-292. Folker, A.P., H. Andersen & P. Sandøe (2008): Implicit normativity in scientific advice – values in nutrition scientists’ decisions to give public advice, Perspectives in Biology and Medicine 54: 199-206.